› Author Affiliations Funding This work was supported by the Agency for Healthcare Research and Quality (AHRQ) Grants R01 HS024091–01 and R21 HS024349–01 as well as the AHRQ Grant P30-HS024379 through The Ohio State University Institute for the Design of Environments Aligned for Patient Safety (IDEA4PS). Background Patient portals, and the secure messaging feature in particular, have been studied in the outpatient setting, but research in the inpatient setting is relatively less mature. Objective To understand the topics discussed in secure messaging in the inpatient environment, we analyzed and categorized messages sent within an inpatient portal. Materials and Methods This observational study examined the content of all secure messages sent from December 2013 to June 2017 within an inpatient portal at a large Midwestern academic medical center (AMC). We analyzed a total of 2,598 messages, categorizing them by sender (patient, family, or care team member), type, and topic, and conducted a descriptive analysis of categories and an examination of code co-occurrence. Results Patients were the most frequent message senders (63%); family members sent the fewest messages (10%). We identified five types of messages: Alert/Request; Thanks; Response; Question; and Other (typo/test message). 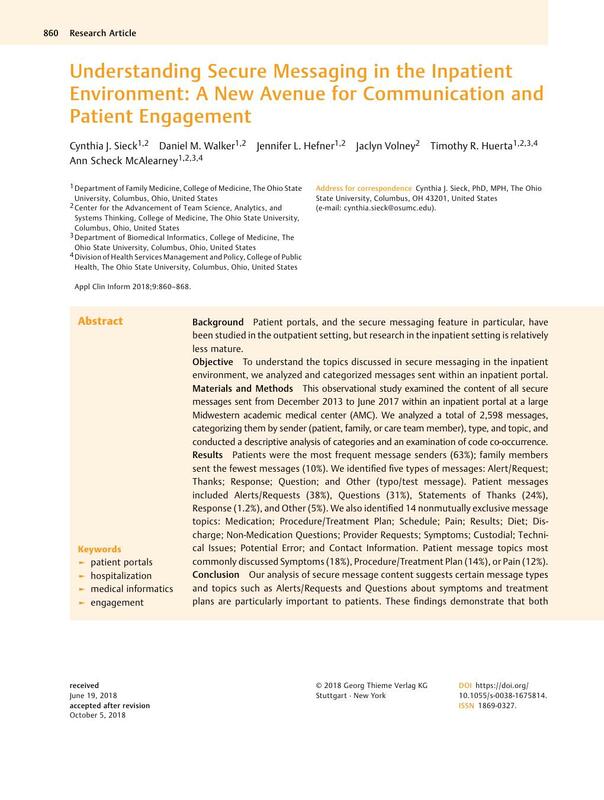 Patient messages included Alerts/Requests (38%), Questions (31%), Statements of Thanks (24%), Response (1.2%), and Other (5%). We also identified 14 nonmutually exclusive message topics: Medication; Procedure/Treatment Plan; Schedule; Pain; Results; Diet; Discharge; Non-Medication Questions; Provider Requests; Symptoms; Custodial; Technical Issues; Potential Error; and Contact Information. Patient message topics most commonly discussed Symptoms (18%), Procedure/Treatment Plan (14%), or Pain (12%). Conclusion Our analysis of secure message content suggests certain message types and topics such as Alerts/Requests and Questions about symptoms and treatment plans are particularly important to patients. These findings demonstrate that both patients and family members utilize the secure messaging function to engage in the care process by posing questions, making requests, and alerting staff to problems. As this technology is implemented in additional facilities, future work should examine how use of secure messaging may be influenced by factors including patients' demographics, reasons for hospitalization, and length of stay. This study was approved by the Institutional Review Board of The Ohio State University.